Kodak EasyShare SV1011 Firmware installation instructions.Determine If Your Frame Needs This Firmware Upgrade. If Model Code VV or VZ appears on the sticker, your frame has the latest firmware and does not need this upgrade. 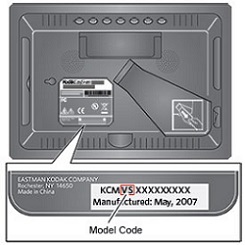 If any other code appears, review the installation instructions, then click Download to upgrade the firmware on your Kodak EasyShare SV1011 frame. Remove the memory card or USB flash drive from your Kodak EasyShare SV1011 frame. Also, you click here for Kodak EasyShare SV1011 Downloads.